Anything that addresses its audience as “intrepid eaters” asks to be approached with a touch of apprehension. Gastronauts, dreamed up by April de Angelis, Nessa Muthy and Wils Wilson, is teasingly tight-lipped in its marketing material, explaining only that the show will offer a range of tastings for its “brave dinners”, along with the details necessary for them to make informed choices about what they eat. Probably not for fussy eaters or the squeamish, then. Led into a dimly lit holding chamber in the upstairs theatre and instructed to drink from glasses of lurid Alice in Wonderland-style potion, the automatically tentative stance seems justified as we prepare to throw ourselves headlong down the rabbit hole. But for all the uneasy mystery and foreboding hints, the Royal Court’s surreal theatrical dining experience lacks the bite it so tantalisingly promises. The basic concept of the show is contained within its title: we are travellers, embarking on a flight towards the flavours of the future. Once seated at our tables on board Lizzie Clachan’s futuristically reconfigured performance space, the cast of four gamely point out the nearest exits, while Alasdair Macrae as our pilot and maître d’ is a deliciously oddball host, at once strange, charismatic and lightly threatening. He reassures us, with a twinkle in the eye, that “nothing here will harm you – in the normal sense of the word”. His introduction, as it turns out, is a fitting primer for the show itself: quirky, kooky and charming, laced with just a dash of menace. In keeping with the modest courses brought out one by one to delight our taste buds, the show itself is divided into small, bite-sized portions. The performers slide in and out of their roles as waiters to present short sketches on everything from derivatives trading to family dinnertimes, punctuated with Macrae’s brilliantly wacky songs. The audience watch all of this from our tables, eating and drinking throughout. There are, as one expects, a few surprises served up on our plates, but none that are particularly unpleasant or challenge our consciences too taxingly. Even one seemingly unappealing dish ends up being surprisingly innocuous, the tense frisson prompted by its arrival quickly settling into grinning relief. And herein lies the problem. As a novelty dining experience, Gastronauts ticks most of the boxes: idiosyncratic waiting staff, eccentric host, a range of dishes that assault and confound the senses. As a meditation on our species’ messy relationship with food, however, the Royal Court’s creation is disappointingly uneven, movingly clumsily from madcap comedy to cutting critique while trying too hard to cover all bases. One impetus for the show was the recent horsemeat scandal, which brought the question of where our food comes from right to the fore of the public consciousness, offering more than enough material to chew on. 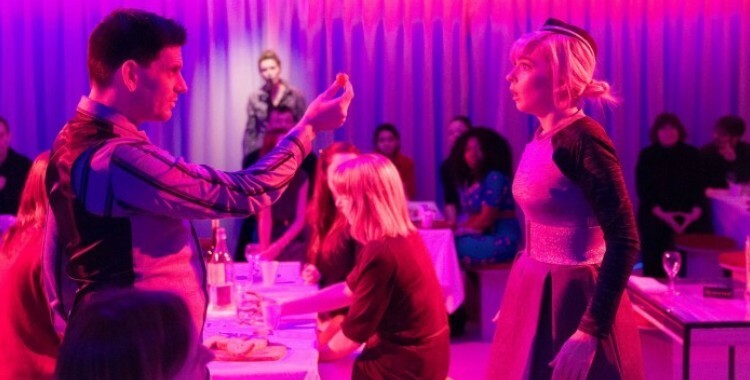 Rather than focusing attention here, however, the show distractedly casts its gaze in all directions, also offering nods to eating disorders, food banks and the communal ritual of eating together. Taken – like the menu – as a set of tasters, there is plenty to relish. Visions of food crisis offer a bitterly entertaining satirical portrait of the unappetising future we are potentially heading towards, while there is a mad, hallucinatory joy to watching the cast don cow masks and sing about how we’re all fucked. But for all its playfully provocative statements, the appetite for probing critique is left unsatisfied, even if our hunger is appeased. Instead of making us think twice about what we blithely gobble down, Gastronauts hands us a spoon and urges us to dig in.